After 2 years, I am working again. It’s a part-time job in Berkeley, which necessitates commuting via BART. Fremont to Downtown Berkeley is about 50 mins, so I have plenty of time to do things like knit or read. One of the neat things about my new job is that it’s only a few blocks from Cakes & Purls. Since I got my first paycheck this week, I decided to treat myself with a new skein of sock yarn for my BART knitting. 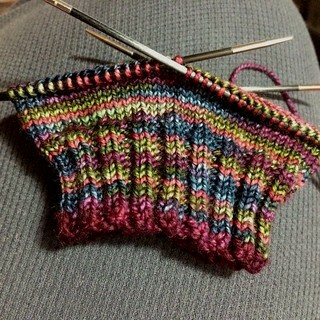 Normally, I’d knit my socks on circular needles so that I don’t rick losing a needle on BART, but I’ve been really enjoying knitting with my set of Knitter’s Pride Karbonz DPNs. The yarn I picked out yesterday is Blue Ridge Yarns Footprints in Wild Cherry. It’s 2 skeins of yarn — one 300 yd skein of variegated colors and a 100 yd skein in a matching solid color. The main skein of Wild Cherry is a blend of really pretty deep jewel tones, and the smaller contrast skein is a dark purple that I’ll be using for the cast-on, heels, and toes. I’ve been knitting for something like 12 years now. Somewhere along the line I started planning out some patterns on my own as well as adapting others (e.g., the Little Sailor Girl saga from a couple years ago). Last year, my friend La, who runs Dizzy Blonde Studios, asked if I’d be interested in designing something for the Mean Girls’ Yarn Club. I got the yarn from her at Stitches West in February and got to work. The pattern is currently only available to Mean Girls’ Yarn Club members, but will be available for purchase in about 6 months. 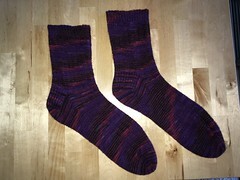 You can find more information at http://www.ravelry.com/patterns/library/stiletto. Have I really been away from my knitting blog for almost a year? I have no idea how that happened… well, maybe a little I do. The funding for my job was cut at the beginning of November, and I was let go. 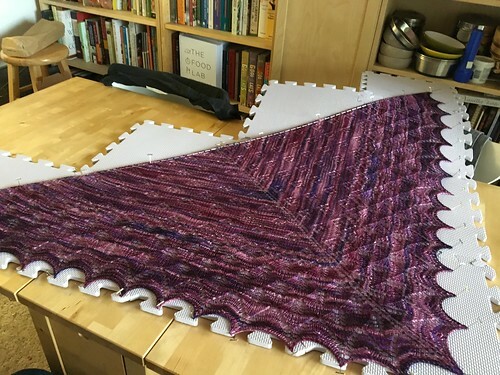 I pretty much stopped knitting or spinning for several months as I descended into a funk. I knit a couple of things that were requested, but otherwise I lost all love of the things I love for awhile. I got through the holidays and the new year and started to come back to myself. The knitting started up again. The photo taking has been woefully inadequate, but I hope to be rectifying that soon. Meanwhile, just here to remind myself I have a blog before things get to crazy with the training I’m starting next month. The knitting went ‘round and ‘round. I’m not entirely sure why one of the smallest elements of the sweater seemed to take the longest. 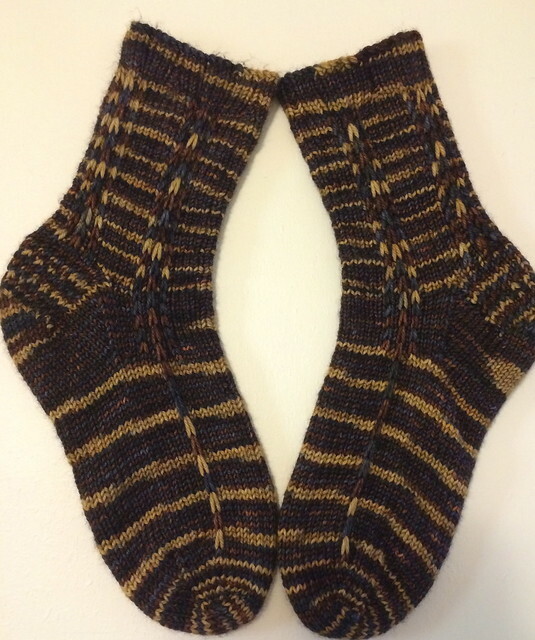 Now that the striped garter stitch edging is cast off, I must admit that I am very glad I decided to knit it on rather than sew it on as called for in the pattern. By picking up and knitting the stitches I was able to switch directions at the collar turning, which allows the striping to be right-side out on the collar as well as the body of the sweater. It also saved me from going loony trying to sew the edging on, trying to make the corners match up correctly with the corners of the sweater. I am quite proud of how my corners turned out; they’re nice and corner-y, gently rounded rather than wonky, which is how I was afraid they’d turn out. 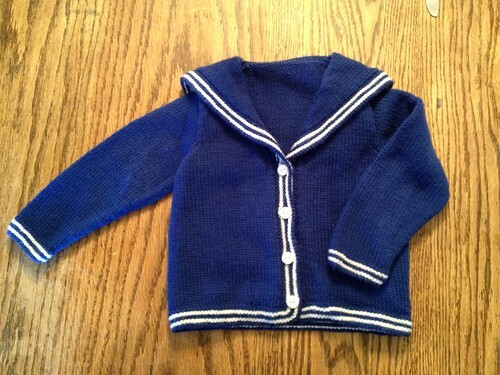 Sewing on the sleeves went pretty much the same way the whole sweater has. The armseye seemed to be a little bit bigger than the sleeve cap, so I knew the easing in of the set-in sleeve would involve a lot of easing. Thankfully, there were a couple of points that needed to match up, which made figuring out how much sleeve there was compared to armseye easier. I had to redo the seaming on the first half of the first sleeve 3 times. In the end, I determined that a 1 sleeve stitch to 2 armseye rows until reaching the armseye decreases would be what was going to work rather than doing the standard 3 sleeve stitches to 4 armseye rows ratio. This made the second sleeve go much faster. The underarm seam seemed easy-peasy in comparison. I just realized that Friday, September 28 was the 6th year anniversary of this blog. Oh, sure it hasn’t always been at this location. And sure, I may have gone one of those years and only blogged a couple of times. But it’s a little hard to believe that Knitting from Outer Space has been in existence for that long, or even that I’ve been knitting for 10 years. It’s kind of interesting to consider how things have changed in that time. 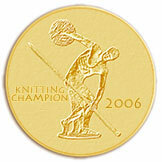 Some of the knit bloggers that I first started reading back in 2004 are still around. Sadly, many aren’t; they either simply stopped updating, or in some cases, deleted their blogs all together. Ravelry sort of had the same effect on knit blogs as Facebook had on Livejournal; everyone abandoned their separate little islands to be part of the bigger whole. I’ll admit I was one of them. Ravelry had so much more interaction (especially after they added the Forums), then an average knit blogger like myself saw in their comments section. I don’t know why I recently decided to try my hand at it again. I think part of it is trying to reconnect with my own knitting in a way. 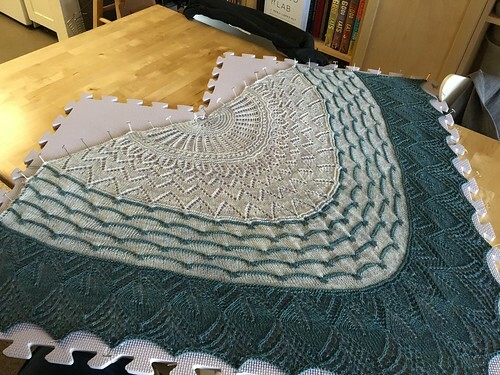 I feel like I’ve been spending so much time reading about others’ knitting or searching for patterns that just lengthen my ever-growing queue that I don’t actually sit down and enjoy the feeling of needles and yarn in my own hands. I recently started taking a spinning class at my LYS, and it’s made me slow down my process and examine what I’m doing rather than dashing off headlong and being disappointed that things don’t work out quite as I was expecting. It’s made me remember that I feel calmer and more relaxed when I work with wool at least once a day. I have no idea if anyone out there is still even reading my blog anymore. I know that as I stopped blogging, I stopped reading other blogs as much (especially when Bloglines was going to go away* and I switched to Google Reader, which only stores the previous month rather than up to 200 posts per feed like Bloglines did). I’m working at getting back into the habit of checking my blog feeds at least a couple times a week. Then, I’m going to work at commenting more so that other knit bloggers know there’s someone out there reading them. Meanwhile, I’m also going to start working on my blog revamping project again. When I first started blogging at Blogger.com they didn’t have tags or categories, so none of my posts had that information when I transferred over to WordPress. When I moved my blog, I had to go through and change photo links (because I changed photo services at the same time); after all that work, it seemed hard to go back through and tag things. But, now the compulsive archivist in me wants everything to be nice and tidy. *Apparently, Bloglines did not go away like they said it would. It looks like it changed hands. Unfortunately, it’s been so long they don’t have my information anymore. The end is so close. All that’s left is stitching on the sleeves and knitting on the striped border. Originally, the border was supposed to be knit in a big long strip and sewn on at the end. Personally, I just thought that was stupid, especially because sewing on the border causes the portion of the border that goes up and around the collar to be reverse and not look as nice. 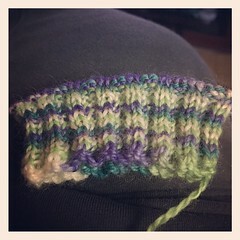 I picked up the stitches from the provisional cast on I did, then picked up stitches up the front using the 3 stitches to 4 rows method. When I got to where the collar folds over, I switched the picking up so it left the pick up seam to the back. I’ve put stitch markers in place to show the divisions between back and sides, front corners, where the collar switches from the body, and the corners of the back collar flap. The most important ones being the corners (so I know where to do corner increases) and the collar markers (so I know to switch from purling to knitting or vice versa). Little Sailor Girl’s sleeves were relatively easy. I knit both at the same time to ensure they were the same length and the like. Then, I had to rip one of them back to the end of the increase section because I had dropped a stitch and left it behind for 6 inches. So, I finished the sleeve that was good to clear it off the needle before ripping back on the other. So, body is joined together and the sleeves are gently blocking. Next is the border… oh, border.